Want the delicious flavor of a caramel apple without all the mess that goes with food on stick? 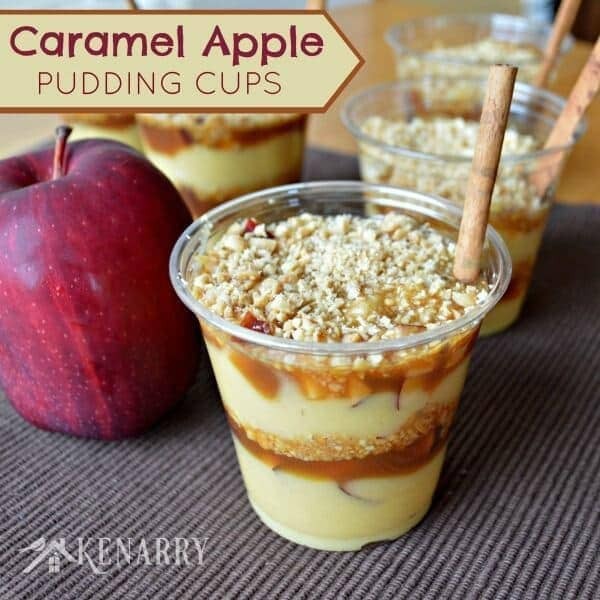 Try these decadent Caramel Apple Pudding Cups instead. 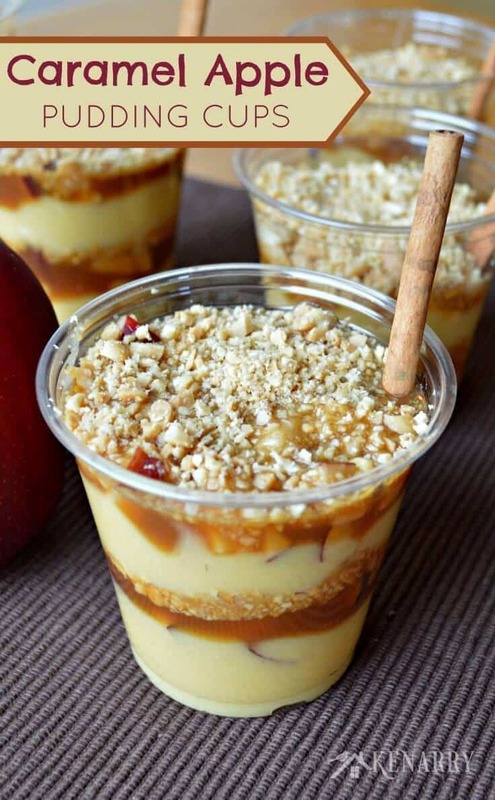 Caramel Apple Pudding Cups are a sweet treat layered with flavored pudding, chunks of apple, rich caramel topping and chopped nuts to give you a dessert your family can enjoy with a spoon. Serving the Caramel Apple Pudding Cups in clear tumbler glasses also makes them look super cute for fall and Halloween entertaining. Tuesday marked the beginning of fall here in North America, bringing with it cooler temperatures and cravings for all things apple. 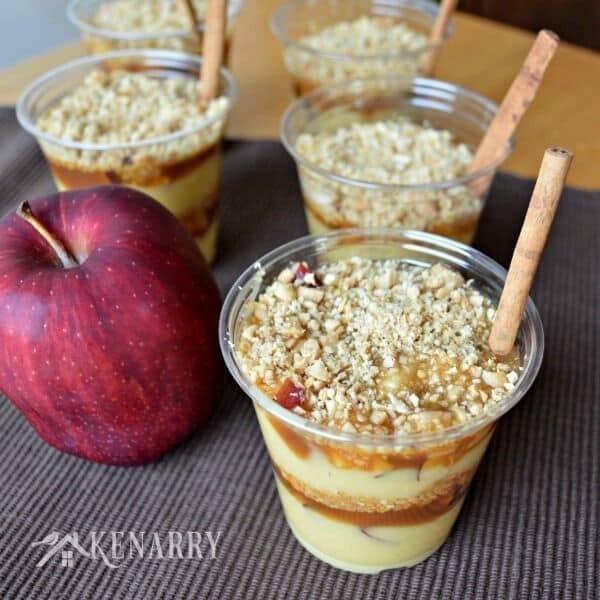 I, myself, am not a huge fruit fan, but couldn’t resist creating these sweet Caramel Apple Pudding Cups for my family to enjoy after dinner one night. I used a small container of store bought applesauce and a pinch of cinnamon to enhance the vanilla pudding. I’m hoping we can go apple picking some time in the next few weeks, though, so we can make our own cinnamon applesauce to use next time. Want the delicious flavor of a caramel apple without all the mess that goes with eating food on a stick? Try these decadent Caramel Apple Pudding Cups instead. 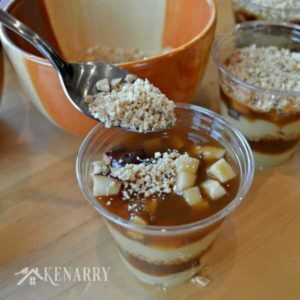 This sweet treat layers flavored pudding, chunks of apple, rich caramel topping and chopped nuts to give you a dessert your family can enjoy with a spoon. 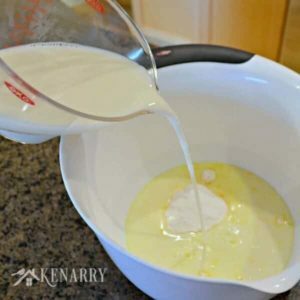 In a medium sized bowl, whisk together the instant vanilla pudding and cold milk. Stir in the cinnamon and applesauce. Refrigerate the pudding for 5 minutes. Cut the apple into small bite sized chunks, discarding the core. Set out your four ingredients to create the layers: pudding, apples, caramel topping and chopped nuts. Using 4 or 5 clear plastic cups, put 3-4 tablespoons of pudding in the bottom of each cup. 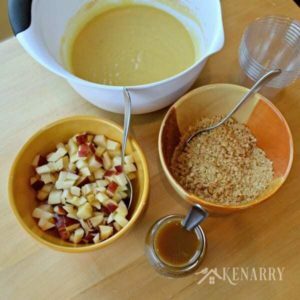 Next, add 2 tablespoons of chopped apple, followed by 1-2 tablespoons of caramel topping. Sprinkle 2 tablespoons of chopped peanuts as the next layer. Repeat each of the layers one more time in the same order ending with the chopped nuts. Garnish with a cinnamon stick (optional) and enjoy! The caramel topping makes the Caramel Apple Pudding Cups incredibly sweet. As an alternative, you could skip having multiple layers. 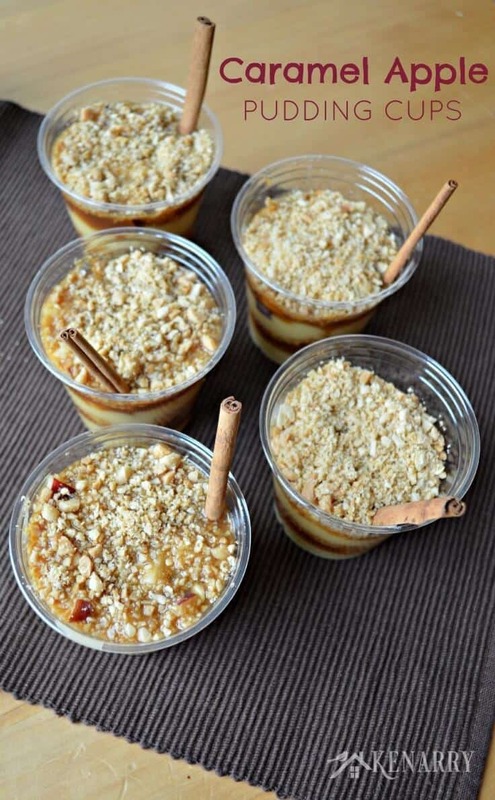 Instead just fill the cups with the cinnamon apple pudding, then top with apples, caramel and nuts. I wanted the dessert to be kid friendly so I used plastic cups. You could really dress up this dessert for an adult evening by serving it in wine glasses, champagne flutes or even martini glasses. The chopped peanuts started to take on moisture from the caramel topping. If you’re going to be making the Caramel Apple Pudding Cups in advance, I’d suggest waiting to add the final layer of chopped nuts until you’re ready to serve them. Originally published September 2014. Updated September 2018. This looks so yummy Carrie!! Gotta try it! Awww, thanks Bobbi! I appreciate the pin too! Those look like a delicious sweet treat! My kids would love them! Thanks for sharing them with us at Foodie Fridays, Carrie! Your kids need all the extra calories so they can burn them off with all their athletic events! What a fun and busy life you lead, my friend! Thanks for your kind words, Jessica and your sweet invitation to your link party. I tried to swing by to join us, but it’s already closed for the week. I’ll keep an eye out for the next one. Thanks for your sweet comment, Shari! I definitely came by to party with you all again this week. Thanks for hosting! This looks soooo good! I must try it! Thanks for sharing! Pinning! Thanks for pinning, Michelle! I really appreciate it. Oh Carrie these pudding cups look simply delicious! I love the individual cups, and the cinnamon stick in each! Saying hello from Wimsey Wednesday! Thanks, Cathy! They’re very good and very sweet! So glad you took time to come by from Whimsy Wednesday. Thank you! These are so pretty! And they look scrumptious! Pinning! Thanks, Kelly! I’m glad you liked them and appreciate the pin! Very true, Carrie. Very true! 🙂 Thanks for stopping by! 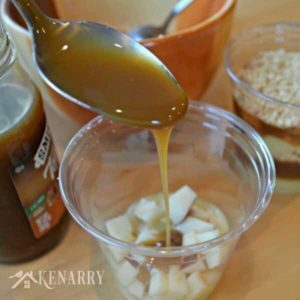 Such a great way to enjoy apples and carmel without baking! Thanks for sharing at SNF. Thanks, Laura! I’m so glad you enjoyed them! This is a GREAT idea! my kids will love it! 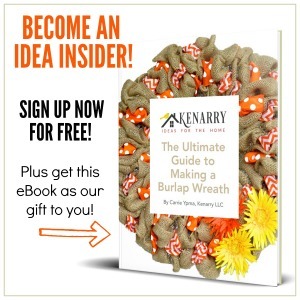 Thanks for linking up to DIY inspired- you’re being featured tonight at Handamde in the Heartland so be sure to stop by! Awww, thanks Angela! I’m thrilled you loved this recipe enough to feature it at DIY Inspired tonight. Thank you! Thank you! We’re not of a nut eaters at our household so I thought maybe in place of the nuts I might use the HEATH BITS ‘O BRICKLE Toffee Bits to sprinkle on top. I think that’s a wonderful idea, Colleen! It would also be delicious with graham cracker or vanilla cookie crumbs as replacements for the peanuts. This would definitely fix that problem, Kayla! 🙂 I hope you enjoy them. This looks fantastic, thanks for sharing on craft schooling Sunday, wonderful to “meet” you. So glad you enjoyed the recipe. It’s great to “meet” you too! How about that? LOVE the addition of applesauce to the pudding…and making these great layers. Brilliant! Pinning and making soon. I found this on the Pin Me linky party. My boys would definitely love a treat like this. Pinning. Diane, I’m so glad you found us. Thanks for pinning our post. We hope you and your boys enjoy the recipe. Good idea to put apple in caramel pudding. Thank you from Tasty Tuesday Creative K Kids. I pinned your post at Pinterest board. Thanks for visiting from Tasty Tuesday Creative K Kids, Maria. Hope you had a great weekend! Hi Carrie, This sounds & looks amazing! Pinned, shared & can’t wait to try. Thanks for joining the party! See you again soon. Thank you, Theresa! I’m thrilled you liked the recipe and grateful you pinned it too. Yummy. I might make an adult version for a Halloween party this weekend. Thanks for sharing with us at #Throwback Thursday link party. Hope you join us again tonight.. I hope you and your party guests enjoy the treat this weekend, Quinn! Thanks for stopping by. So, has ANYONE actually made this recipe? It LOOKS good but how does it taste? Hi RBS, we’ve made the recipe! If you like apples and caramel, then we encourage you to try it and let us know what you think. We really liked it, but my husband thought the caramel topping made the Caramel Apple Pudding Cups a little too sweet for him. You could just use the caramel on top if you want it less sweet. Ha I thought the same thing. Everyone one puts it looks good or I love ……, but no one put that they did try it and what they thought. One of my pet peeves. Other than the person who put recipe up, no one has made it! Paula, we would love for you to try the recipe and let us know what you think!